Pick up a sweet treat at Candy Direct, online at CandyDirect.com. 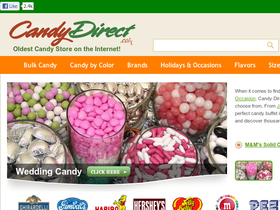 No matter what your favorite candy is, you're sure to find it at Candy Direct. With hundreds of different types of candy, your mouth will be watering for top brands including Hershey's, Haribo, Jelly Belly, Necco, Lindt's, Ghirardelli, Cadbury, and more. When it comes to finding color coordinated candy for a Wedding or a Special Occasion, Candy Direct has the largest selection of confectionary items to choose from. Save on your next candy purchase with the latest and greatest Candy Direct coupon codes, Candy Direct promotions, and Candy Direct discounts from RetailSteal.com. CandyDirect.com calculates shipping costs according to the weight and volume of the items ordered. If there is a problem with your order, you may return it for a refund or replacement. Exceptions to this return policy are special orders, bouquets and toy products, which cannot be returned or refunded. See site for full shipping and returns information. Spend $500 or more on your order from Candy Direct and use this coupon code to save $25. Click to save. Shop gum at Candy Direct and save up to 30% on select items. Click link to shop. Use this coupon code at CandyDirect.com and save 7% off your order of $1000+. Use the coupon code online at Candy Direct and save 5% on your order of $500 or more. Click to shop now. Shop at Candy Direct and save up to 55% with their specials on your favorite candies. Enjoy free shipping on select candies under $40 for a limited time only. Buy candy in bulk from Candy Direct and choose from one of the largest selections of candy from as low as $1.50 per pound.